I have a young student who’s made remarkable progress this past year. The only problem is that her fingers practically run away from her. I’ve been trying to help her keep a steady tempo but I recently realized that she doesn’t seem able to feel a steady pulse. I’ve asked her to clap while I play, tap her foot while she plays, count out loud, feel the heart beat of the music, etc. But nothing seems to work. Daniil Trifonov is one of six finalists in the 13th Arthur Rubinstein International Piano Master Competition and today he’ll be performing the Schumann Piano Quintet Op 44 (streaming live here) . I became a fan of his during the International Chopin Competition where he placed 3rd. He’s only 20 years old so I know we’re going to be hearing a lot more from him. Deutsche Grammophon pianist Alice Sara Ott is one of the nominees in the newcomer category. In this video she talks about how she started piano, one of her signature pieces – La Campanella, and practicing. Other nominees in this category are classical guitarist Milos and violinist Vilde Frang. All three amazing young musicians! Since I’m always on the lookout for new piano music for my students I was happy to stumble upon a posting by Kristen Yost where she mentioned Africa by Neeki Bey. This book features ten songs including a hymn and a freedom song from South Africa, a pop song from Kenya, an Egyptian folk melody and more. The book is written for late beginner through early intermediate but I am using it with my beginning teen students. In the spirit of getting our students to just “Go Play” I recommend taking a break from dry and wordy explanations of rhythm, articulation and melody. 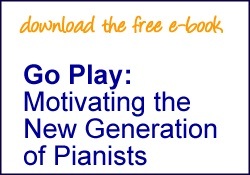 Pick up the book, listen to the CD, try out the pieces, sing along and have fun. I like to write. Tell me to sit and write anything I want to and I’m hamstrung. But give me a writing prompt and I dive right in. I feel the same way about free piano improvisation. 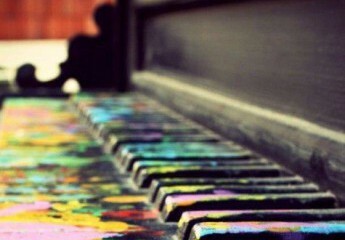 If I sit at the piano and play anything I want to how will I know if it’s any good? What am I supposed to be listening for? And as a teacher, how can I teach students to improvise over a chord progression if I’m not clear on exactly how to do it myself? I came across this video by Dave Spicer from Brisbane, Australia. He is the director of the School of Music Online and has an easy to follow explanation of how to improvise a right hand melody over a chord in the left hand using resolution/tension notes and passing, circling and extended tension notes. Several light bulbs went on all at once for me while I was watching this! Classical, jazz, rock, whatever the style…this is what melody and harmony all boils down to. Now, instead of a writing prompt, I’ll just take a chord. Any chord. Gosh, I can’t wait to adapt this for my students who are all learning major, minor, various seventh chords! My social network of choice is Twitter and like Erica Sipes, I too have found a great support group of musicians that I can check in with any time of day (or night) to bounce around ideas, get inspired, or just chat. I’ve recently been reading about one Twitter friend, pianist Wayne McEvilly, and his work with Mozart in the Schools, a program he implemented in 1974 when he recorded all 17 Mozart piano sonatas on a 5 disc set and distributed it to elementary school classrooms in Los Alamos, New Mexico. He says the Mozart Sonatas send the students a “message of positive energy” and a “general attitude of all is well” – the same message he sends out through his Tweets every day!